The Keauhou Resort has partnered with the Ho‘oulu ka ‘Ulu project to present Breadfruit Festival 2011, which takes place on Saturday, September 24th at the Amy B.H. Greenwell Ethnobotanical Garden in South Kona. To promote the use of ‘ulu and the Breadfruit Festival, Keauhou Resort is presenting Taste of ‘Ulu at the Keauhou Farmers Market and at select Keauhou restaurants during the week prior to the Festival. 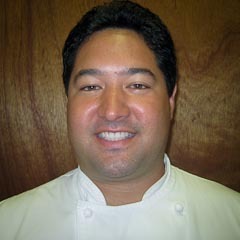 Chef Clem Kaimiola of the Sheraton Keauhou Resort & Spa demonstrates. 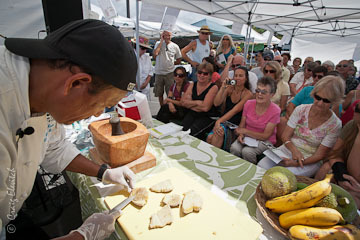 Chef Clem Kaimiola of the Sheraton Keauhou Resort & Spa presented a Breadfruit cooking demonstration at the Keauhou Farmers Market on Saturday, September 17.The Sheraton Keauhou Bay Resort & Spa, Keauhou Beach Resort, and Sam Choy’s Kai Lanai highlighted breadfruit dishes during the week leading up to the Breadfruit Festival on Sat, Sept. 24, 2011. Steam ‘ulu like you would steam a potato, until it is soft. Refrigerate cooked ‘ulu for 4 hours. Make the relish. Place the rest of the ingredients in a bowl, mix and refrigerate. Slice ‘ulu into 5 slices and fry in oil until golden brown and crispy. Season with salt as it comes out of the oil. Serve the ‘ulu hot with the cold relish on the side or poured on top. Enjoy! Dot ‘ulu cloves with 1/4 cup butter. Wrap in foil and bake 350-degrees until tender (approximately 45 minutes). Cut 1 breadfruit in half and rub the flesh with butter and salt. Place in a baking pan with 1 cup water and bake at 350° for 1 hour, or until soft when pierced with a fork. Scoop the softened flesh into a food processor and whirl until it is a mashed into poi consistency. 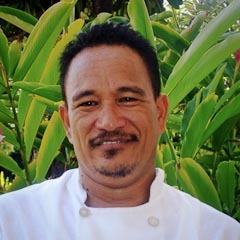 Clement Kaimiola, Executive Sous Chef, was part of Sheraton Keauhou Bay Resort & Spa’s pre-opening team in 2004. A demonstrated leader, Kaimiola worked his way up the ranks beginning his culinary career in an island resort kitchen, also as dishwasher. 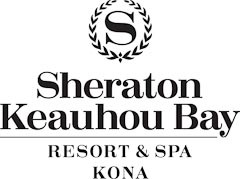 Prior to joining Sheraton Keauhou Bay, Kaimiola worked as Executive Sous Chef at the former Kona Surf Hotel (which is now Sheraton Keauhou Bay) and as Chef at Paradise Gourmet in Kona, catering some of the most prestigious events and private affairs on the island. Born and raised on the island of Oahu, Kaimiola has called Hawaii, the Big Island his home for more than twenty years. Among his many duties as “#2” in the kitchens, Chef Clem takes particular pride in ensuring an authentic cultural dining experience for guests at the weekly luau dinner and show.